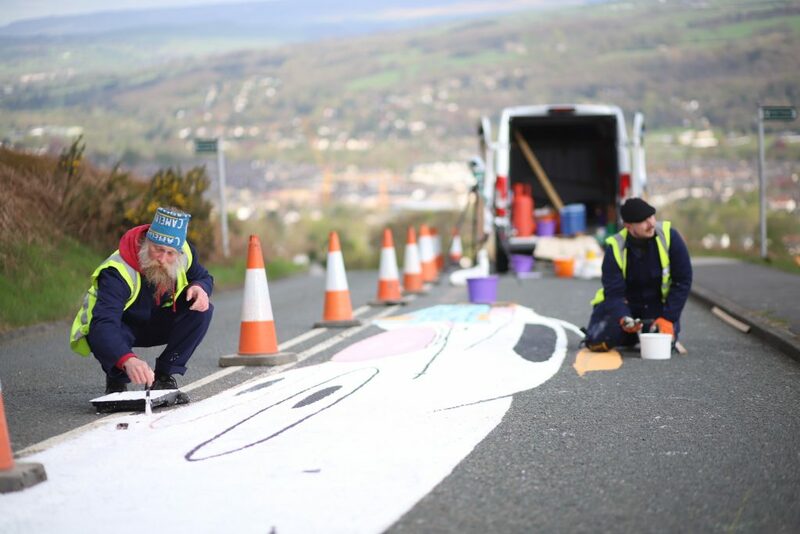 It was great to make some anamorphic art to welcome some of the best cyclists in the world to Ilkley for the Tour de Yorkshire 2018. 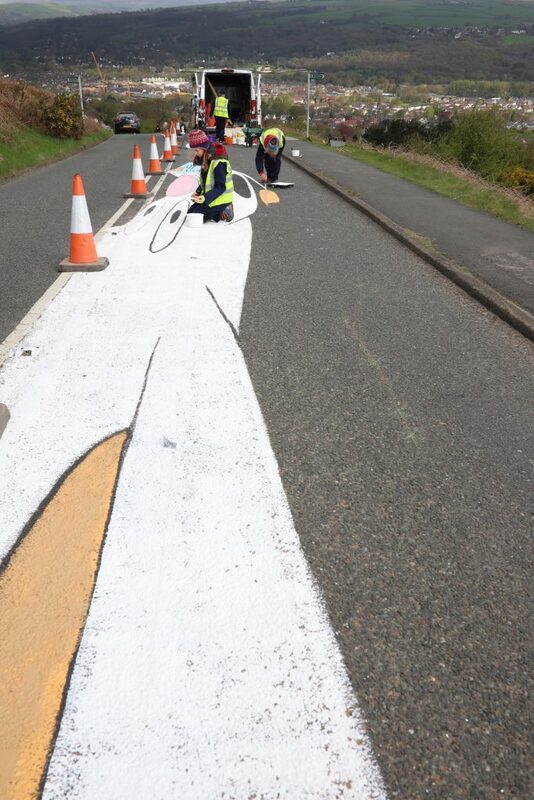 We’re all big fans of cycling at Sand In Your Eye and were really excited to see the Tour de France pass through our beautiful county in 2015 and have been watching the Tour de Yorkshire since it began, we have been really pleased to make some urban art for them this year and last. 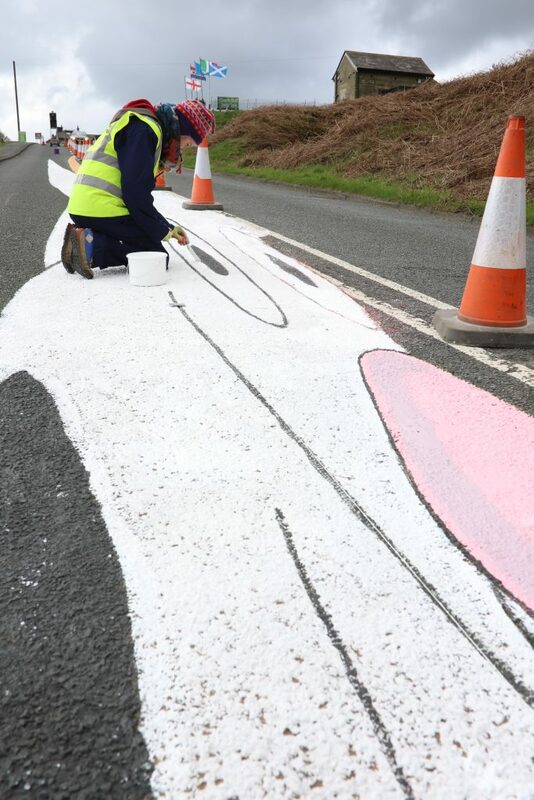 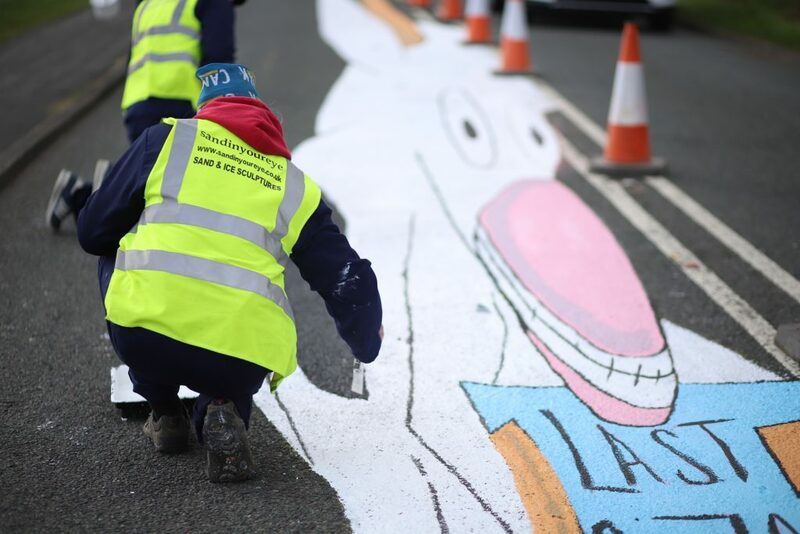 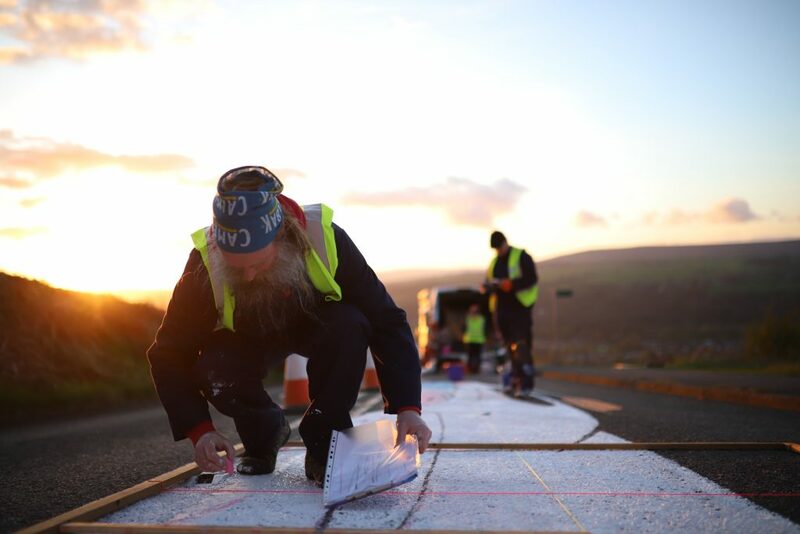 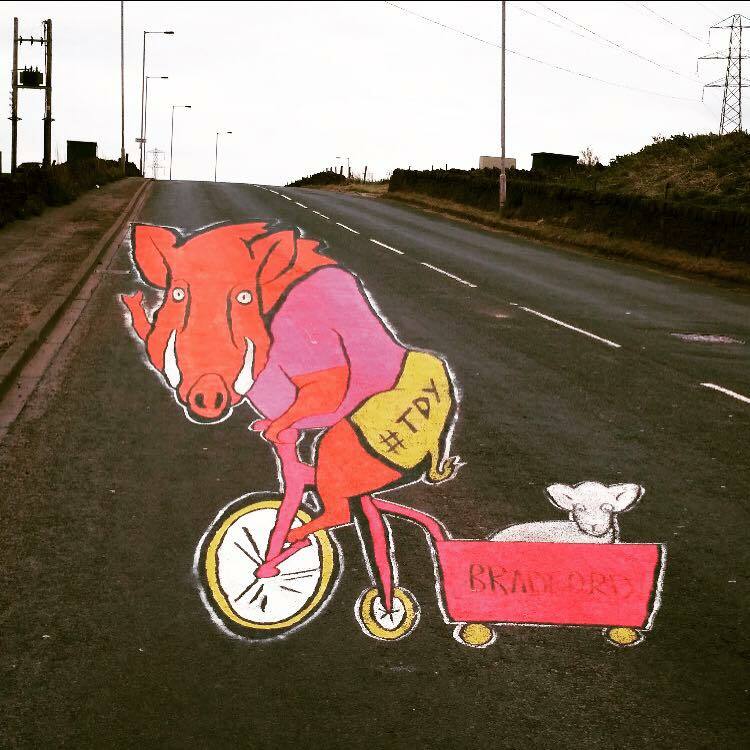 In 2017 we headed over to Jamie’s hometown of Bradford to do a road painting of the Bradford Boar at Keelham farm. 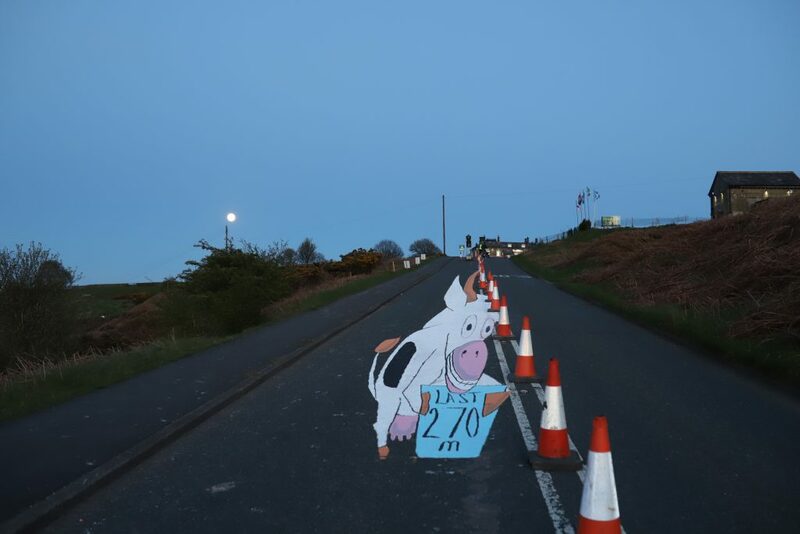 This time round we were on Ilkley Moor at the Cow and Calf, so it was obvious what we were going to do! 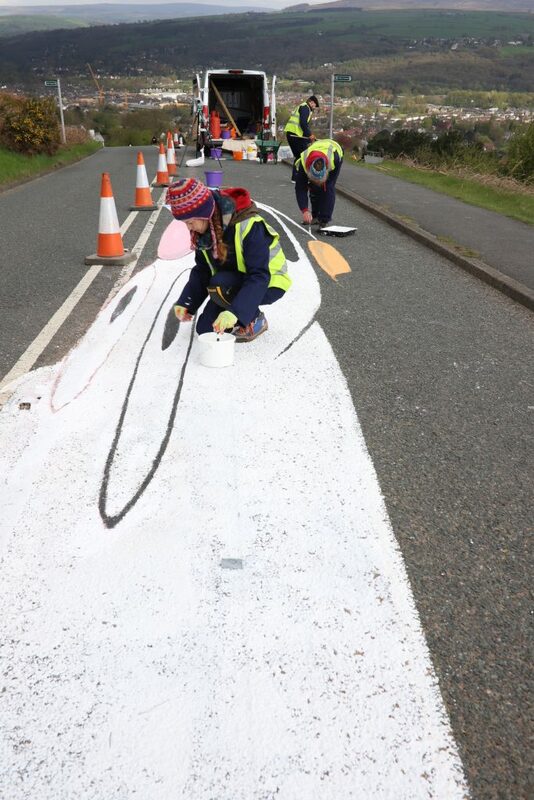 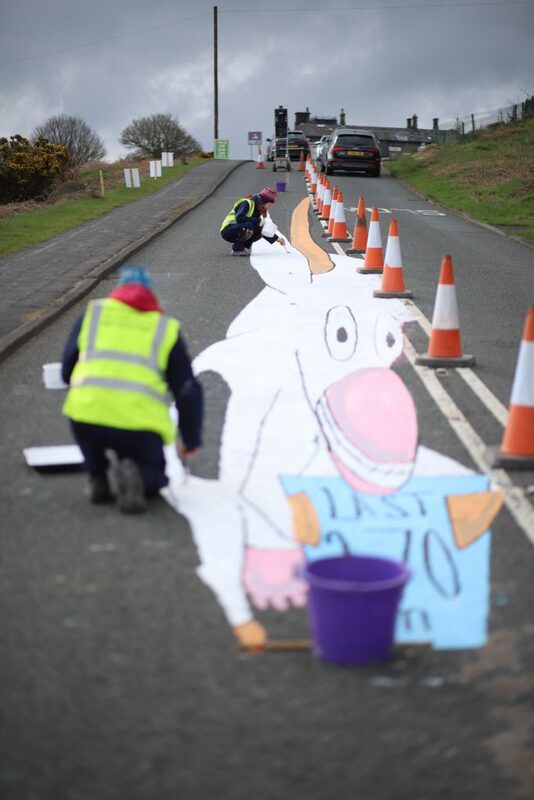 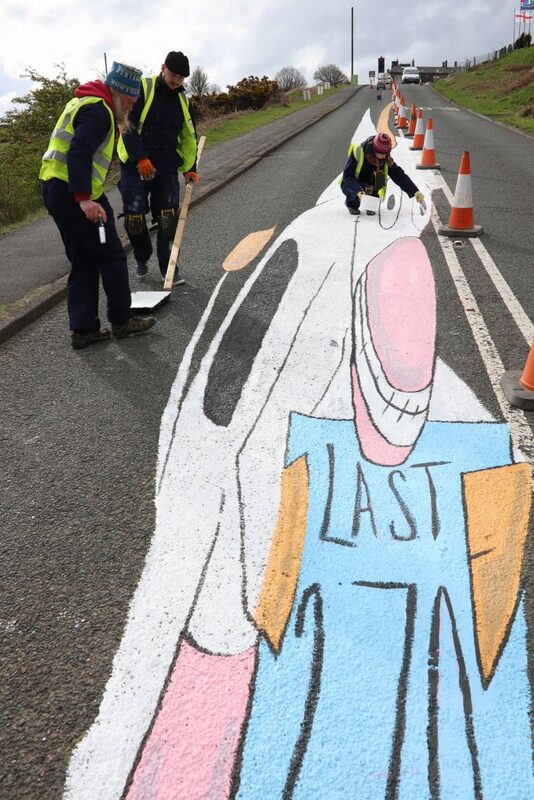 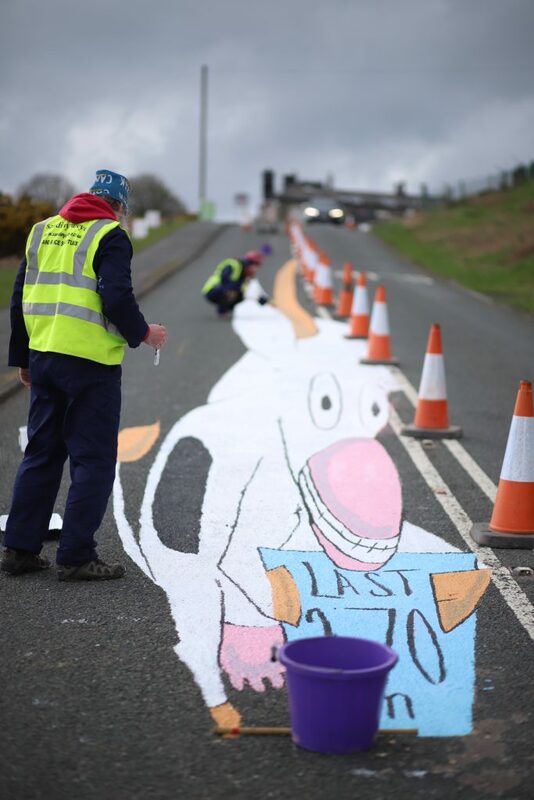 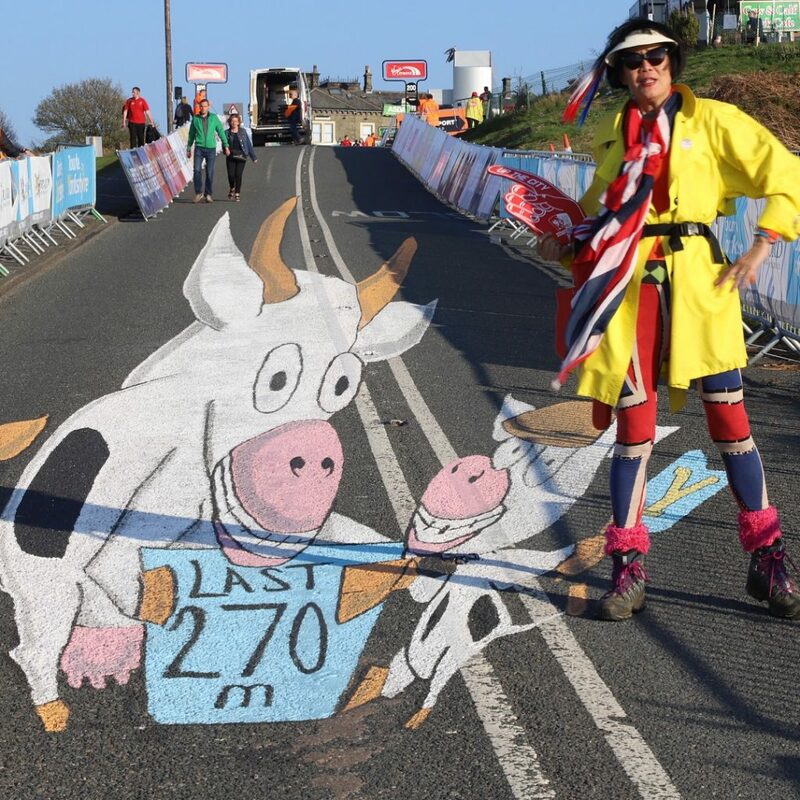 The second day of the tour would finish at the Cow and Calf and our street art would let the riders know that the end was finally in sight. 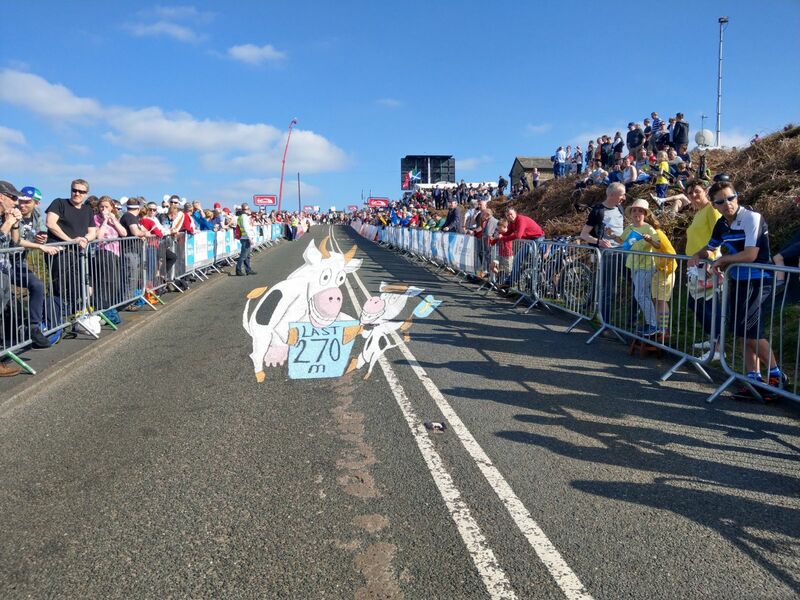 There are a lot of hills in Yorkshire but this is the first time there has been a hill finish on the TDY, so it was quite unique and a real honour to be asked to make some 3D anamorphicart to mark the occasion. 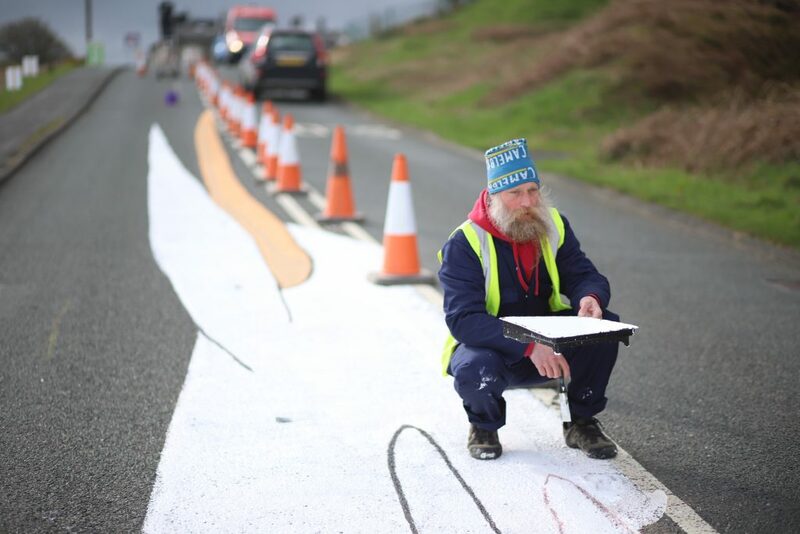 Jamie Wardley, Claire Jamieson, Rich Spence and James Wilding took 3 days and 100 litres of paint to create the 4 metre wide, 45 metre long, colourful, stretched out, anamorphic land art. 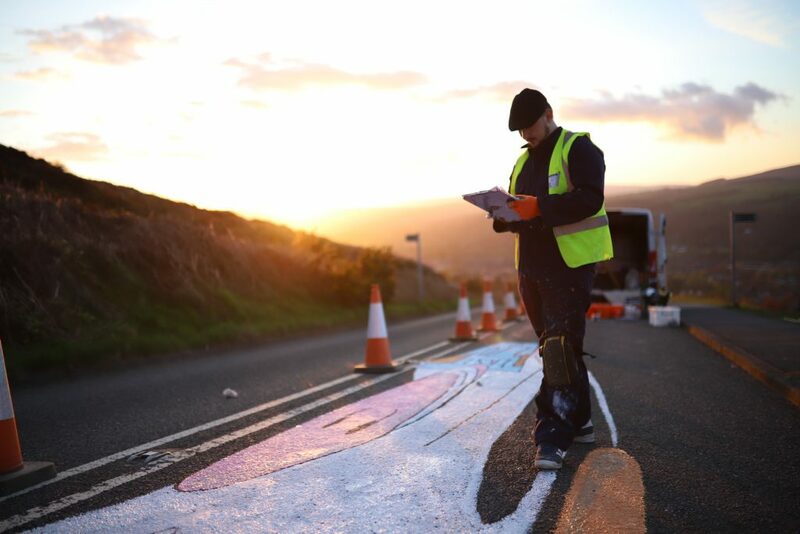 It was lovely to be on the hill in the crisp spring weather looking down over the vista of Wharfdale and Ilkley, and we enjoyed some beautiful sunsets. 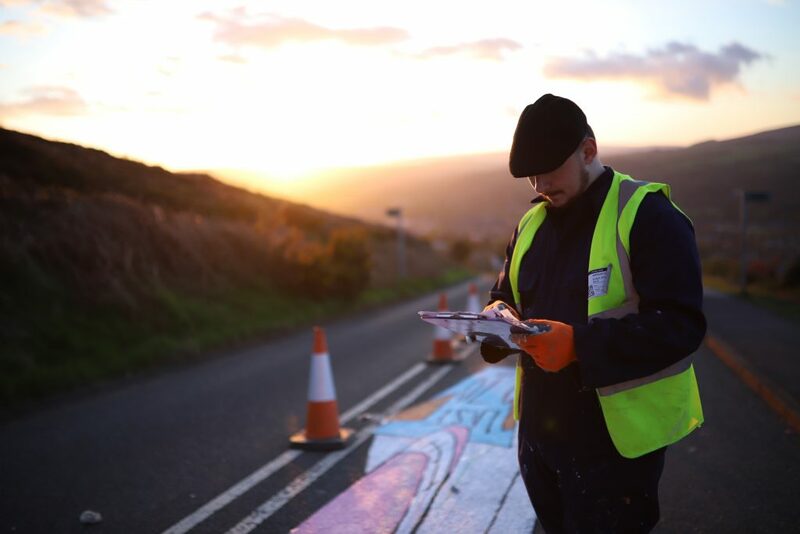 We had the place to ourselves, apart from the tooting of passing traffic interested in what we were doing. 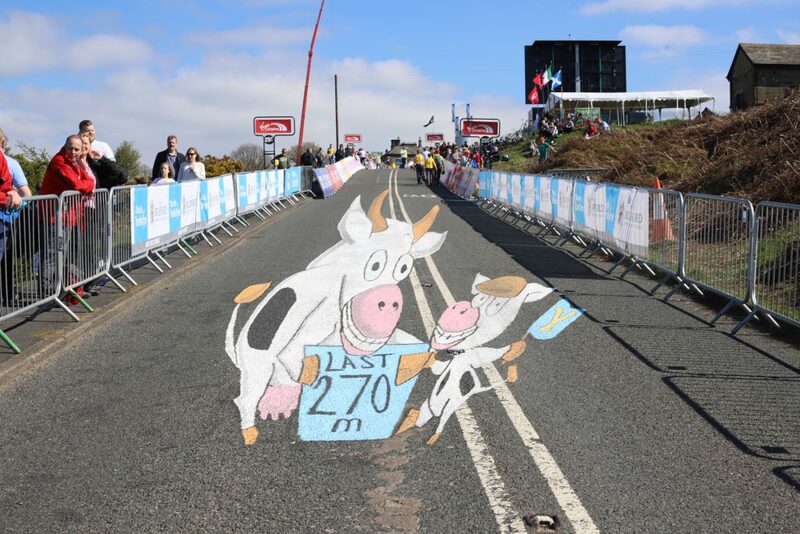 Not so during the actual race, with helicopters swirling overhead and thousands of people gathered for a party atmosphere to cheer on the riders as they cycled over our street art. 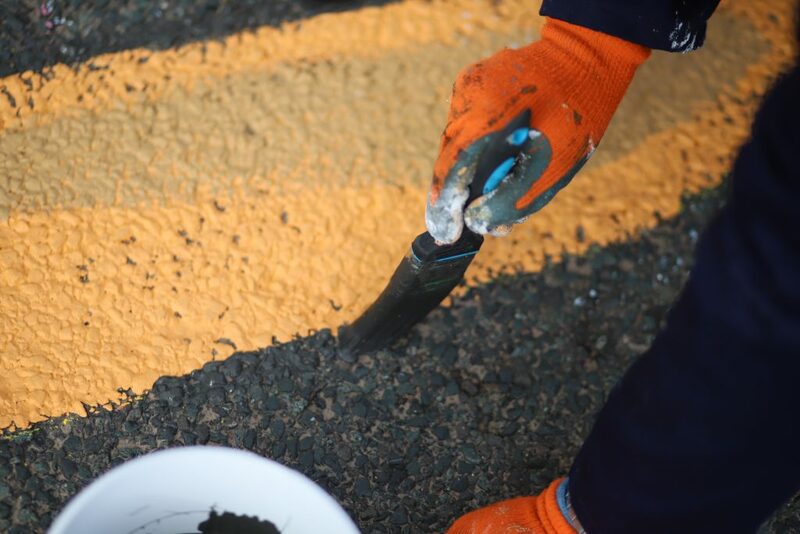 When making an anamorphic painting it is extremely difficult as the image is so warped and making long straight lines is so important as the most minor anomaly by even a couple of centimetres looks totally wrong. 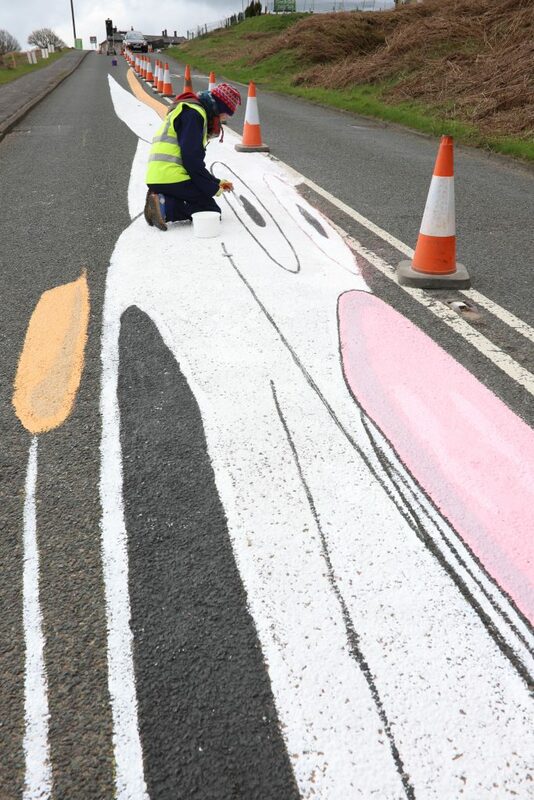 Luckily we had the perfectionist “Laser Line James” on board to make sure we were spot on. 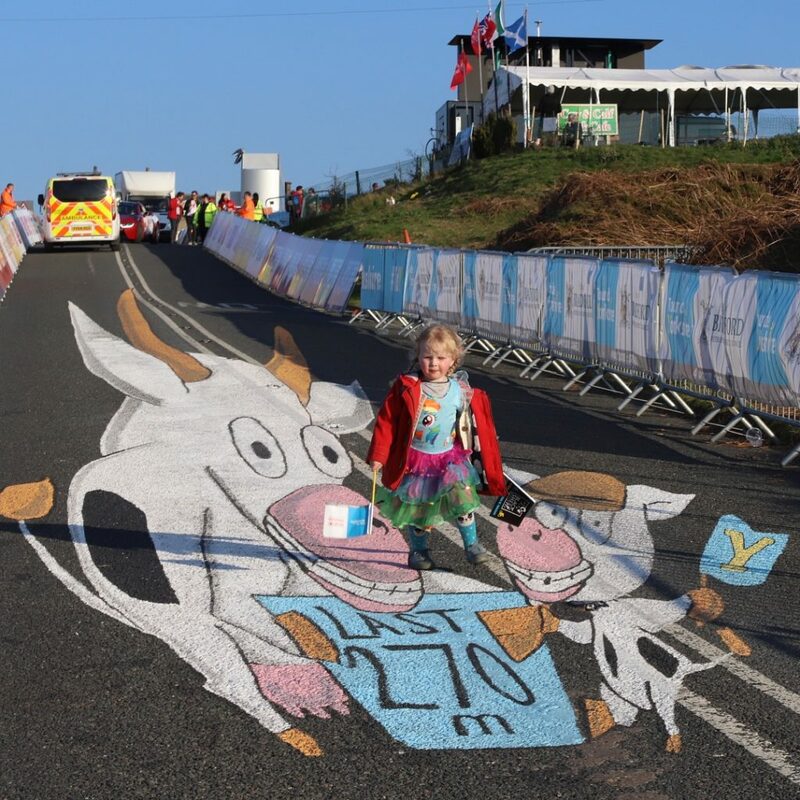 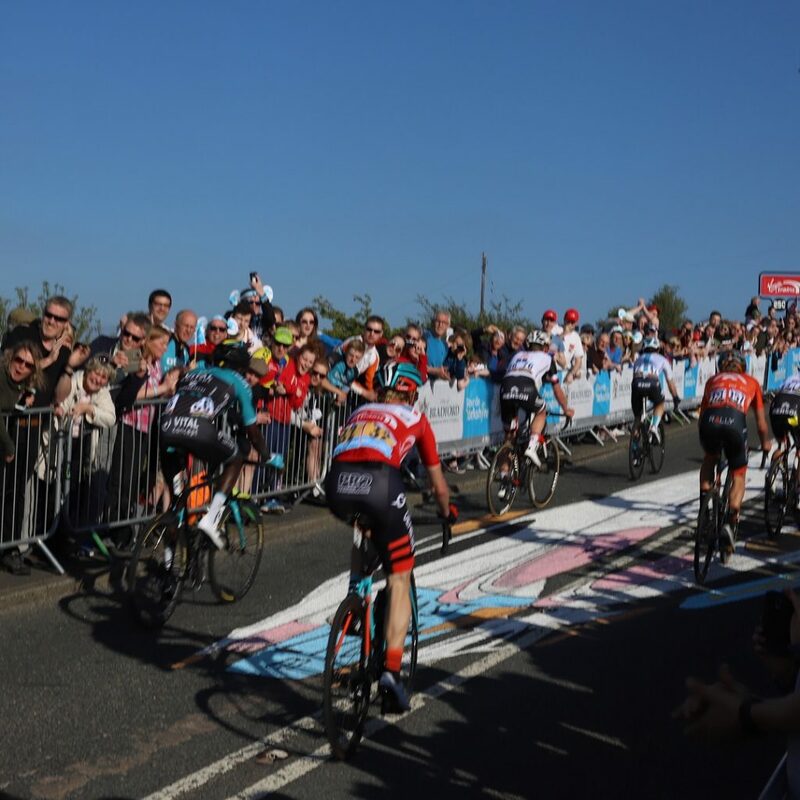 You have to stand in exactly the right place for the 3D effect to work, it must have been a bit trippy for the Tour de Yorkshire cyclists to suddenly have a cow and calf loom into view – especially after such a grueling climb, but they made it look easy! 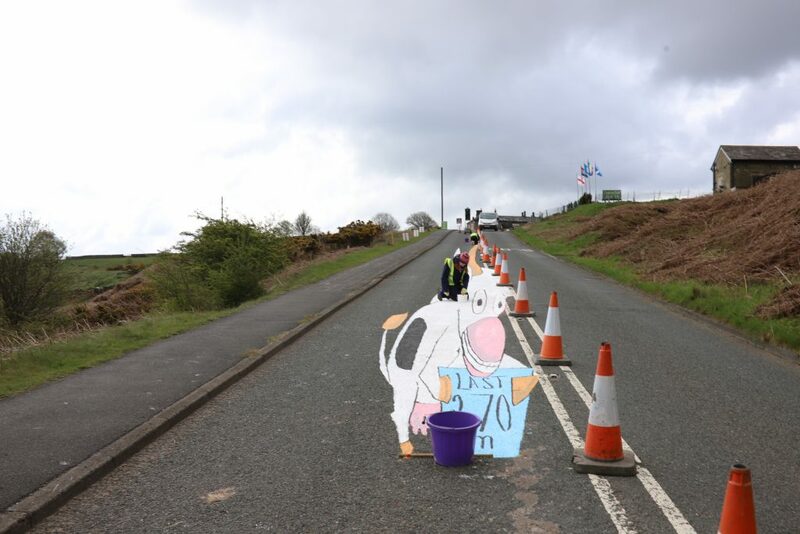 We prefer going downhill. 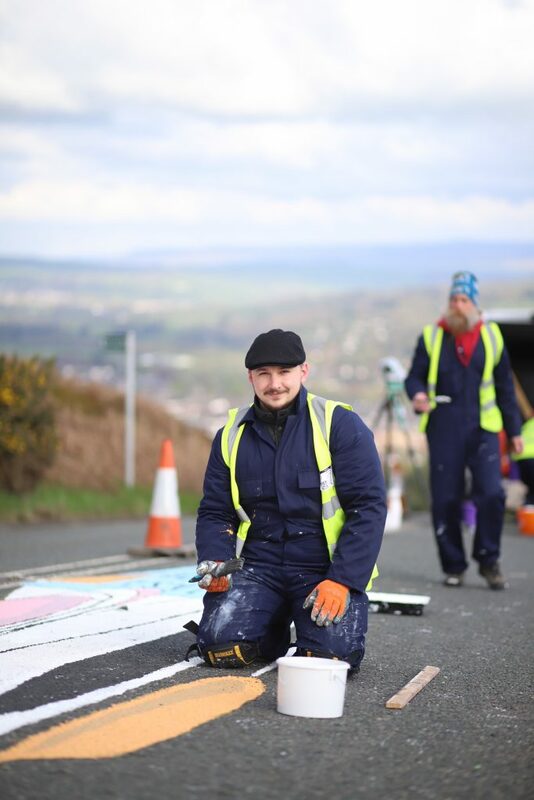 It was a busy Tour de Yorkshire themed week as we also worked with Trinity Leeds to celebrate the Tour by constructing a yellow bicycle on the roof of the shopping centre.